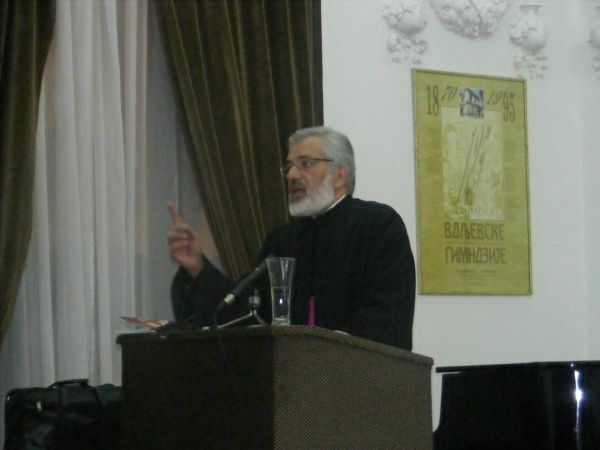 Valjevo, Serbia - A lecture was conducted by V. Rev. Dr. Milos Vesin on Tuesday, November 3, 2009 in the hall of the Valjevo Gymnasium in Serbia. Fr. Vesin is the parish priest of St. Archangel Michael Serbian Orthodox Church in South Chicago and Professor at the Theological Faculty of the Serbian Church in Libertyville, IL. He holds a doctorate in theology and psychology. His Grace Bishop Milutin of Valjevo, accompanied by a great number of diocesan clergy, greeted all in attendance. Fr. Milos spoke inspiringly on the source of anger from a Biblical, psychological and patristic point of view, pointing out the ways in which we can battle against it. He mentioned that to fight against anger we must battle within, defeating it with Christian methods and not allow it to leave us and thereby harm those around us. “A Christian is one who does not harm others,” said Fr. Milos, citing the words of the Saint Abba Barsanuphius. Patristic literature is filled with beautiful thoughts and considerations about anger, while contemporary psychology speaks to us in a scientific manner that which Chrsitianity has taught us for already 2,000 years. Fr. Milos highlighted the great significance of love and that true love resembles the flame of the candle, regardless of how many other candles are lit through that candle, that first flame always remains whole. Anger in us grows from our inability to defeat our vices through love and we must be lead by the words of Christ who teaches us to love our enemies. Protojerej Milos Vesin is known for his humanitarian work as he helps the needy in Kosovo as well as in Serbia. He called upon all the people of Valjevo for a greater mutual love and a collective battle against anger in ourselves.